Last week we began our series Politics on the Field featuring pieces about where sports, life, and politics intersect. The second contribution comes to us from Monica Kostas, who also has done the artwork for our series as well many Recomposition works. She describes soccer in the life of her hometown while giving background on the sport’s history and radical roots, and reflections on playing in a militant life. In an era of unprecedented money driving the clubs and leagues, soccer gets lost in the ruckus of what capitalism does to it. With her piece, Monica reminds us of the beauty and joy that’s at stake to fight for a match worth playing. *Soccer and fútbol are used interchangeably. It’s hard to explain the extreme fanaticism that soccer carries in a country like Argentina. It is filled with euphoria and heartbreak, it creates lifelong relationships and rivalries, and it offers the most talked about topic in every day conversation. It’s the thing you ask a stranger after you learn their name, “De qué cuadro sos?” What team do you root for? You demarcate right then and there and so determine what kind of relationship you will have with that person. It’s like the drawing of the ichthys in the sand by the Christians to see if they were in good company or not. Friend or foe. Though team scarves have long replaced the rosary beads, many still believe Catholicism is the predominant religion in the country, but it’s not; it’s fútbol. On Sundays, people don’t go to church; they go to the stadium to watch their team play. As late Uruguayan writer Eduardo Galeano once said, “Fútbol is the only religion without atheists”. Deeply entrenched in everyday life, people simply live fútbol. There are sports radio stations dedicated mostly to covering soccer, popular TV channels that run matches and commentary around the clock, and newspapers whose covers often rival between the latest political scandal and the incredible score from last night’s game. 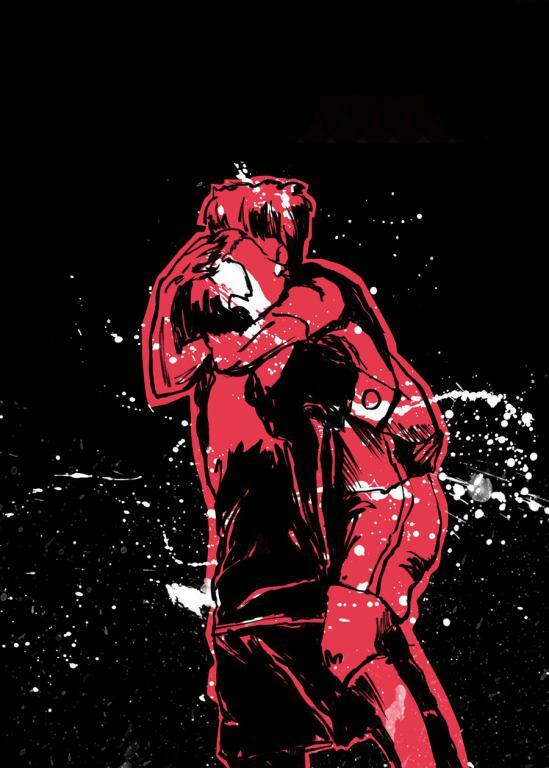 In a country where 9 out of 10 people declare themselves fans of a fútbol team, it is inevitable to see that these fairly monogamous fan-team relationships, with little to no divorce rate, bear passionate and romantic undertones. Paying attention to the plethora of chants sung at the top of fans’ lungs, phrases like “wherever you go I’ll follow”, “you’re my heart’s content”, “when I die, I want my coffin to carry your colors”, highlight the unfaltering narrative of sentimentality and love for the sport. My family, despite not being the most active fans around, was nevertheless affected by the intense dose of soccer that thoroughly permeates the entire country. As long as I can remember, my dad has always been a surly, anti-social, Darth Vader type who hates music, films, sports, people, and anything that is human related. But if anyone asks which team he roots for, he tells them either that he outright hates sports, or that he hopes Platense will win the championship. The pressure of neighborhood nationalism weighs heavy even on the apathetic. Platense is the team that represents the neighborhood where my brother and I grew up. The mascot is the squid because in the early years of the team, Platense would play in a field close to the Rio de la Plata (the river that borders Buenos Aires), which would often flood. It was in these conditions that Platense played best, and so the nickname stuck as the players covered in mud moved graciously like squids in their ink. Back in the day, Darth Vader never cared much for watching games with us, but if Platense scored he’d crack a smile on his frozen face. Nowadays, he’s a bit more invested and never misses an Argentina game in the World Cup. Even an ex-socialist, turned deeply conservative, sooner or later succumbs to the opium of the masses. Soccer always had a special place in mom’s heart. Back in South Korea, soccer was all the rage while she was growing up, so she would sit for hours watching games with her siblings. Unexplainably, she chose treachery and become a Platense fan as well, opposing the choice of my brother and me to follow the greatest team in Argentine history, River Plate. “Los Millonarios”, the Millionaires is the team’s nickname due to the high prices that the club paid (in the ‘30s) for a few players that would become historical icons in the trajectory of Argentine fútbol. Growing up, soccer didn’t play a physical role in my life. It isn’t usual for girls in Argentina to play soccer as much as it is for boys who play virtually everywhere—in school, at the park, on the street, and in sports clubs. My fútbol-related activities were limited to cheering during matches, learning the songs, religiously watching Captain Tsubasa with my brother, and idolizing the stars: Francescoli, Batistuta, Crespo, Sorín, Saviola, and plenty more excellent players that we were lucky to witness throughout the ‘90s, a glorious period for fútbol. Soccer didn’t quite materialize for me until much later when I was already living in the US and attending high school. It was in 10th grade that I decided to join the soccer team. The coach was my English teacher, and he took me to the field for tryouts where we kicked the ball around for a bit. I showed him some juggling tricks, things I had learned from my brother, and he put me on the team. I wasn’t the best though, and the team in general wasn’t very good. We lost regularly since we didn’t have much training, and the school didn’t offer any resources for our improvement. We could defend ourselves against regular teams, but we would always get wrecked by the charter and private school girls who seemed to be professional soccer players already. Whenever we traveled to the wealthy suburban schools, we knew we were about to get our asses handed to us. Soccer years happened right smack in the middle of adolescence. These were times of inner turmoil what with being a teenager ripped away from my hometown, friends, and everything that was familiar to me. Added to the mix was also living in an abusive home, and in US suburbia which provided no outlets for a young person from a big city. It was a recipe for frequent combustion. Naturally, soccer became a therapeutic escape for me. It was a chance to avoid going home after school, and instead go to practice and run out the anxiety and stress. It was also a way to include exercise in a lifestyle heavily dictated by driving, a good setting to make friends, and an opportunity to practice English. Essentially, it was a way for me to build community around my life. On a broad level, my therapeutic relationship with soccer wasn’t unlike that of many kids who, throughout decades, saw the sport as a way to make it out of a bad situation. In his book Soccer Vs. The State, Kuhn describes that in its nascent years, “playing football [soccer] professionally became a tempting alternative to toiling in the factory. While middle and upper classes arrogantly snubbed the professionalization of the game, the working classes embraced it as an early form of social assent”.2 Those aspirations still persist today, when players like Maradona or Tevez, who came from the roughest shantytowns of Buenos Aires, become icons that fuel kids’ dreams of being part soccer’s social fabric. Argentinos Juniors along with Chacarita share one of my favourite accounts of solidarity in fútbol. The story goes that in the ‘50s, Chacarita was short in people for their murga (a tradition that mixes popular music, street theatre and dancing where, like in fútbol, neighborhoods form their own troupes) and the “hinchas”, the fans, from Argentinos Juniors lent them a hand and joined the murga for the occasion. A strong bond was formed and from then on the hinchas from each team would support and root for each other during games. On Saturdays, Chacarita fans would go see Argentinos play, and on Sundays, Argentinos fans would see Chacarita play. When people asked the fans from Argentinos Juniors what they were doing at the Chacarita stadium they replied, “we’re like brothers”.5 These kinds of massive collective friendships between hinchadas, fan bases, show exactly what solidarity in sports and good sportsmanship is all about outside of the players and the ball. Unfortunately, the rich radical history of fútbol did not stick around for the years to come. As players would start getting bought and sold, fútbol became a thriving business and radical politics quickly left the field and the surrounding scenes. Throughout the 20th century, South America’s excellence at cultivating wonderfully creative players was also its curse. As fans, we had to constantly bid farewell to all our favourite players and realize that our fútbol wasn’t for us; it had become a painful industry of export. A practice whose damages are still felt today when players are put together as a national team yet sometimes don’t know each other, and have never played with each other on the field. The business of making colossal profits out of the game has not only grown out of control in the well known organizations like FIFA, or the national organizations like AFA, or local clubs like River, Boca, Independiente, and so on, but it has also grown to encompass particular groups of fans called “barra bravas”, hooligans, or ultras, as they would call them in other countries. The barra bravas have been part of the fútbol folklore for a long time, and though some appreciate their energy during games in leading the crowds with chants and generally hyping the sense of euphoria, they are fans to whom watching the game and cheering is not enough. Inciting violence is a staple in their operations, but with time they have managed to refine a business model so corrupt and profitable that nowadays they are basically run like mafias. Managers of each sport team pay their own barra bravas. It’s not so much that they want to support them all the time, but they have to, the barra bravas manipulate anyone regardless of status, and if people don’t comply to their wishes they threaten people’s livelihood, or their families. It’s similar to when gangs extort businesses for the benefit of protection except in this case; the barras are the ones threatening harm nearly every time. Not long ago, in 2014, during my latest visit home, one of my childhood friends who works in River teaching English to sports journalists, was trying to get us tickets to a super clásico, the quintessential rivalry, a Boca vs River match. To our misfortune, the barras were threatening an executive of the club putting pictures of his family’s whereabouts in his office to make sure that he wouldn’t give out any more tickets. As is clear, they control almost every aspect of the game-day pipeline: from the selling of tickets, to the parking on the street. They oversee that drugs flow unperturbed throughout the audience; they pay their own police force, etc. Everybody’s in on it. It’s a business worth millions and nobody confronts them because the barras are frightening. To the high-ranking officials of the barra bravas, which, according to them there aren’t any because they’re leaderless (which means no one takes responsibility when deaths occur), their work isn’t about fútbol. Some of them, ironically, aren’t even fans of the club they belong to, they’re outright rival fans, but that’s what happens when passion for the sport takes a backseat and there’s simply a lot of money to be made. When River Plate lost a crucial game that relegated them to the B Nacional (the second division league), Los Borrachos del Tablón (The Drunks in the Bleachers), the barra brava of River Plate went insane. They incited riots after the game where nearly 100 people were hurt, 50 were arrested, and parts of both the stadium and local areas were destroyed. To the barras, dropping to the B league meant a painful and unprecendented event, but beyond defeat, it meant incredible loss in profits as the barras can not make as much money selling tickets for a B Nacional game than a Primera one. There’s no doubt people have deeply negative connotations with the sport; it is understandable, the scandals are endless. However, it would be greatly disingenuous to attribute these blunders to the sport rather than the context it lives in. Growing up within capitalism, soccer reflects the shortcomings of society. In the stadium, one can hear the scathingly racist chants hurled at rival teams, which mirror the dreadful nationalism that spreads through the streets. The sport in general has proven to be quite sexist (I’m sure FIFA’s turf scandal during the women’s 2015 World Cup comes to mind) in its exclusion of women in the soccer scene given that professional women’s leagues, in Argentina at least, only became a thing in the 90s—a short lifespan within a sport history that has well over a hundred years to its name. The sport also reflects the quick evolution of a popular institution becoming a highly lucrative industry with earnings in the billions. The push for exponential revenues forces the game to focus obsessively on wins (more earnings) and performance, pushing players to leave creativity and risk aside, in order to create reliable results. It is precisely this toxic relationship that makes products out of players. It’s a limiting affair that stunts their creativity and style, and pressures them to deliver steadily, and constantly. The ones good enough to get noticed are then immediately sequestered into European teams, creating a void in the sport’s folklore, and leaving fans and barra bravas as the only constant components. Sadly, having to reassert the team’s identity is a job that barras take upon themselves. They use to their advantage the rhetoric that no matter what happens, their loyalty is steadfast, they’re always there. In a way, it’s true. In the South Florida IWW branch, there was a period where we really wanted the union to encompass more than business meetings and trainings. We drafted a plan of extracurricular activities that included doing case work through a solidarity network, creating a website where our members regularly exposed their essays, poems, illustrations and photographs, providing weekly workshops to follow up with member’s workplace maps and discuss worker stories, and organizing monthly socials where the union and its supporters would come together, barbecue, and play a game of soccer. We had learned from organizations like Mujeres Libres that the best conversations didn’t necessarily happen during meetings, but rather in social settings where people would come together and go on hikes, share meals, or play sports. These activities would happen through “ateneos libertarios”, libertarian cultural centers, “which served as a school, a recreational group, and gathering place for working class young people in the years preceding the [Spanish Civil] war”. To quote Enriqueta Rovira, a CNT militant, the ateneos were “both a cultural and a recreational group…There was always a little [educational] talk of some sort. And in that way, ideas got stirred up, they created a sense of being compañeros and compañeras. True, people went to union meetings and the like, but relations within our group were more intimate, the explanations more extensive. That’s where we were formed, most deeply, ideologically.”8 Taking those lessons, we organized monthly socials to provide an informal setting where thoughts, ideas and conversations would flow more naturally, leaving the soccer matches as a space for entertainment, and for deepening relationships with one another outside of politics. The games in particular were mixed, having men and women playing together. Parents sometimes also brought their kids along, taking the opportunity to expose their children to the sport. Consequently, our teammates’ age ranged anywhere from 7 to 60 years old. Now and again, just for comedy’s sake, we would divide the teams according to height. We created our very own super clásicos of tall people vs short people; where the latter started out with a winning streak, but as in all clásicos, luck later switched to the other side. Having those experiences, makes the commercialization of fútbol that much more agonizing. The sport lends itself so easily to adventure, and creativity, but as a system of transactions, the potential is stifled, and the game’s environment deformed along with our relationship to it as fans and players. In the field, soccer is a game of strategy where you have to know who you’re playing against, and who you are playing with, that’s why teams that don’t play together have a hard time playing catch up. It involves comradeship and building people up to a victory, being a hero is often detrimental to the team. It builds endurance making you run endlessly, and gives you jolts of adrenaline that turn you into a machine that can run even faster. It’s also about being funny and making your opponents dizzy while you are dancing with the ball around them. In short, it’s about teamwork and having a good time. As it is, the game makes up such a large part of people’s daily lives in many parts the world over, that it would be naïve not to acknowledge it as a powerful tool we could use to our advantage. It’s worth imagining that if the revolution comes tomorrow, we’re not getting rid of fútbol, the “opium” that gave us so much life, but we’re getting rid of capitalism. We have to take the best assets of the sport and build upon them liberatory ways of enjoying the game, without the pressure of playing for millions or a chance at a better life. Instead, we should play for exercise, for fun, and for community. Monica Kostas is a designer from Buenos Aires. She is a member of the IWW and an editor of the blog Recomposition. 1. Kuhn, G. (2011) Soccer Vs. The State: Tackling Football and Radical Politics (p. 27). Oakland, CA: PM Press. 2. Kuhn, G. (2011) Soccer Vs. The State: Tackling Football and Radical Politics (p. 15). Oakland, CA: PM Press. 3. Libertarian is used to mean Anarchist. 8. Ackelsberg, M. A. (1991, 2005). Free Women of Spain: Anarchism and the Struggle for the Emancipation of Women (p. 54). Canada: AK Press.